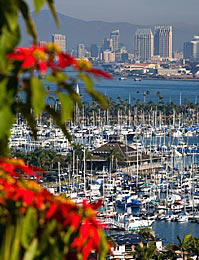 San Diego is known for its bay cruises and harbor tours. Whether it's a romantic excursion for a honeymooning couple, a large wedding party, a large corporate group celebration, or a family vacation experience, there is an ideal pleasure cruise or harbor bay tour for every desire. A short charted excursion, an all day sail, a party boat, a cruise into Baja California waters, a San Diego Bay dinner cruise or a lovely gondola ride with song entertainment. We give you choices. Pick the style for you. Also see Yacht Charters and Sportfishing Excursions. San Diego Harbor ExcursionsThe company provides numerous services including, harbor tours, ferry and water taxi transportation, whale watching excursions guided by Birch Aquarium naturalists, fabulous gourmet prepared dinner and brunch cruises, yacht and boat charters and fairy tale weddings. Bay Watch CruisesBAY WATCH CRUISES provides private San Diego yacht charters aboard a 3-level, luxury motor yacht for 2 to 49 guests. This is a non- fishing boat -- carpeted throughout, rich mahogany interior, and custom-designed furnishings. The Gondola Company - CoronadoIndulge in all the magic and tradition of Venice right here in San Diego as you gently cruise in a private gondola through the enchanting canals of the Coronado Cays. Whether it's a relaxing journey or a romantic adventure, each cruise is A Truly Memorable Experience. Aolani Yacht CruisesA yacht charter on this beautiful catamaran is the ultimate way to cruise around San Diego Bay, enjoy a romantic dinner cruise on a luxury yacht, or plan a yacht wedding on the bay, custom tailored to fit your wishes, desires, wants and requests. Charter Connection Yacht CruisesCharter Connection provides private yacht charters for small groups of 10 to more than 700. We cruise on the beautiful sunny waters of Southern California. We are based on the resort island of Coronado, just 5 minutes from Downtown San Diego, California. Dream Yachts - The Beverly AnnThe spacious and elegant Main Salon invites you to relax and enjoy your cruise. Beverly Ann reflects the luxury and elegance of a five star hotel. Harbor Sailboats Our large fleet of late model yachts range from 22' to 47' and feature the newest designs from Beneteau, Catalina, and Hunter. Superior yachts and professional instruction makes us the right choice for the discriminating sailor. Royal Yacht Charters"San Diego's Finest Sail and Motor Yachts" Also proudly offers Jada, the beautiful 71 foot yawl for a unique sailing experience.